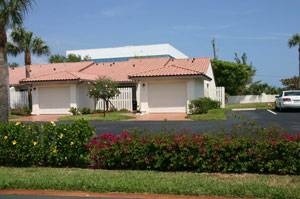 Sea Palms is a small beachside community of one and two story townhomes with garages. Sea Palms is one of only a few communities along the beach with garages. The units are deeded as condos for financing purposes. There are just 48 condos in the community. The 2 bedroom townhomes are about 1,250 sq. ft and the 3 bedroom townhomes are two story 1,700 sq. ft residences. They have a community pool, allow 2 pets under 25lbs and allow two rentals per year with no minimum. They are wood frame construction with stucco exteriors and red barrel tile roofs. Each unit has a small patio off the living room and master bedroom. They have a small vaulted ceiling in the living room and an eat in kitchen. The condos with the South facing patios are more popular as they are much brighter. Browse listings for available Sea Palms townhomes, or see recent sales over the past year . Read more about Jupiter Beach condos. Sea Palms condos are walking distance to shopping, beach and Carlin Park. The Publix shopping center is a 5 minute walk and has one of my favorite restauraunts the Food Shack. Stop in for a fun time and great food. Across the street is the Maltz Theater, once the Burt Reynolds Theater. Carlin Park has a fitness trail, tennis courts and an amphitheater. Loggerhead Cafe is a great breakfast place in Carlin Park. Walk to several other local restaurants, including Jupiter Riverwalk which runs along the Intracoastal here in Jupiter. Lighthouse Cove offers mini golf and Jupiter Dunes a par 3 - 18 hole course is walking distance. Behind the community is Jupiter Bay a popular condo community which has lake views from several buildings as well as a large community pool and Sugar Cane Bistro bar & restaurant. You will love the convenience of this community. Call me for more information about Sea Palms or other Jupiter beachfront communities. The area between A1A and US 1 her ein Jupiter offer so many different condos, townhouses and single family home options I'm sure we can find the perfect beachfront community for you. If you want a single family home Xanadu by the Sea, Ocean Walk, Jupiter Key and Olympus give you some excellent beachfront options. Oceanfront condos such as Jupiter Ocean Grande and Jupiter by the Sea are two popular condos here in Jupiter. Beachfront townhouses would be Oceanside Terrace and Jupiter One as two of my favorite Jupiter communities. For assistance finding the perfect beachfront community here in Jupiter call me as I live and work here on the beach. Maybe a Jupiter beach community is not for you and you want some more space. Abacoa in Jupiter offers larger townhomes and single family homes just a short drive to Juno Beach. If you have any questions about Jupiter beach condos or surrounding communities, please don't hesitate to email or call Jim at 1-561-744-7025 for assistance.